NAKURU COUNTY, Kenya, Sep 22 2014 (IPS) - Just two years ago, Mary Ondolo, a 50-year-old mother of nine from Kenya’s marginalised, hunter-gatherer community, the Ogiek, used to live in a grass thatched, mud house. She’d been living there for decades. But thanks to a donation of livestock and equipment she has now been able to send four of her children local universities and collages and has been able to build a timber home for her family. “I and my husband, apart from our subsistence farming, used to earn extra income through casual labour,” Ondolo, who is from the small village of Mariashoni, in the Mau Forest, which lies near Nakuru in Kenya’s Rift Valley and is about 206 kilometres northwest of Kenya’s capital, Nairobi, told IPS. According to the United Nations Permanent Forum on Indigenous Issues report, historically, hunter-gatherer communities have been and still remain the most marginalised sections of society on the continent. But two ago, a donation livestock and equipment made to Ondolo and a few other women in her community, changed their lives by giving them a steady financial income and, as a result, a role in decision making. “It all started with merry-go-round after I visited one of my friends outside our locality. And having realised the many problems we women of the minority Ogiek community origin face, compounded by the deeply-rooted culture and gender disparity, I mobilised 30 women [in a savings cooperative]. “Members would put their monthly money contribution into a common pool,” Ondolo said, adding that members were entitled to borrow loans for as little as Ksh. 500 (five dollars). Her idea, which attracted the attention of the Ogiek Peoples’ Development Programme (OPDP), a local NGO with close links to the community’s issues, soon led to the life-changing donation. “Having learnt of our organised poultry rearing groups, OPDP in partnership with Kenya Community Development Foundation [KCDF] helped us start poultry and beekeeping enterprises,” Ondolo said. 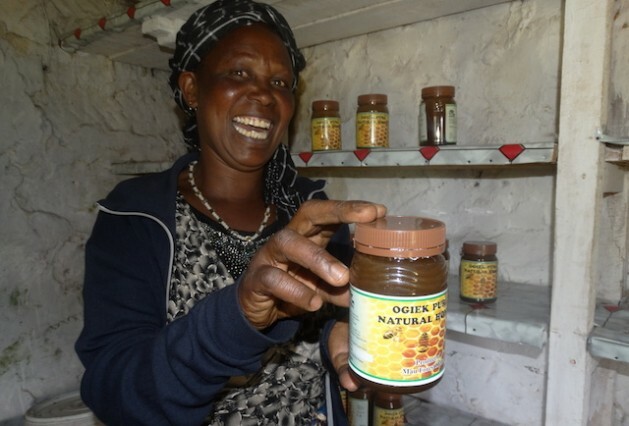 So in 2012, in the small village of Mariashoni, a group of 80 women gathered at an open field surrounded by the indigenous Mau Forest to receive improved indigenous chicks, poultry-rearing equipment and feed. OPDP had received about 22,000 dollars in funding from KCDF, which it used to purchase the livestock and equipment. Honey-harvesting equipment and 40 beehives were also given to the Langam Women’s Group and Ogiek Women’s Empowerment Group. The women were also given skills training. “My husband’s source of income comes from small subsistence farming. But thanks to the beekeeping project, I have been able to help my husband pay school fees for our children two are in university and two are in college currently, and the others are in primary and secondary school,” Ondolo said. She is also now a lead member of the Langam Women’s Group. “Without any sense of power whatsoever, their participation in decision-making is minimal, both at home and in the community,” Daniel Kobei, a member of the OPDP and the Ogiek community, told IPS. Jane Rotich, a member of Ogiek Women Beekeeping Empowerment Group agreed. “Practical and cultural barriers limited the participation of us Ogiek women in decisions affecting our community, aspects of our public life, as well as in economic progress and development,” she told IPS. In Nessuit location, about 10km from Mariashoni, Agnes Misoi, 30, was also a beneficiary of the poultry project. She currently owns over 60 chicken, having sold some to pay for the education of her two high school children. She told IPS that prior to the introduction of the poultry project, she relied mostly on her husband — a subsistence farmer. “I no more rely heavily on my husband for basic household needs. In fact, my husband has numerous times asked for my help financially of which I have been able to assist,” said Misoi, adding that she normally accumulates about 200 eggs in a month, which she sells for about 24 dollars. And her husband, Samuel Misoi, has been grateful for her financial support. “Nowadays, [my wife] is the one assisting me during financial difficulties. She helped me purchase timber for completion of our new house,” he told IPS, pointing at a three bed-roomed timber house under construction. Fanis Inganga, a gender officer with OPDP, told IPS that the project brought great changes to the Ogiek women’s attitude, as they were now more confident to work and contribute to the economic and social betterment of their families and community. To maximise profits and lock out brokers, the women only sell their honey to the Ogiek Beekeepers Association, which is affiliated to Mariashoni Community Development (MACODEV), a community-based organisation that refines and packages the honey into a final product. MACODEV’s chairman Martin Kiptiony said that the women’s groups have ignited a great challenge to the men who used to consider themselves as only ones fit to engage in beekeeping. However, poor road network bars the women’s groups from accessing readily-available markets. Instead they have to sell their packaged honey and poultry products at public gatherings in the locality. A 250ml tin of Ogiek Pure Honey sells for three dollars.